The wait is finally over. Netflix app which was previously only available for iPad has been updated to version 1.10 to bring full compatibility with all the iPhones and iPod touches out there. In other words, Netflix app is now a universal binary across all the iOS based devices, oh and it is free! Netflix app for iPhone, iPad and iPod touch allows you to stream all your TV shows and movies right on any of your iOS based device. • It’s part of your Netflix unlimited membership. Not a Netflix member? Start your FREE trial today. 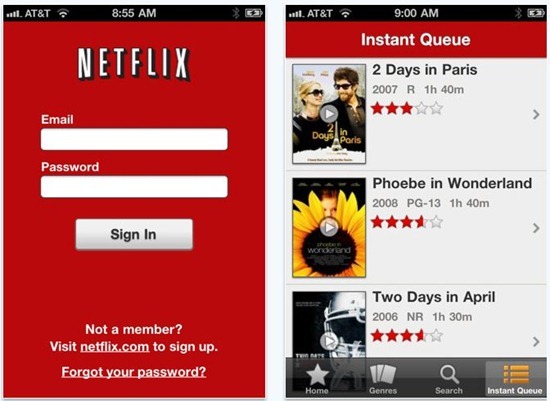 Netflix app now supports iPhone and iPod Touch in addition to iPad! So what are you waiting for? Head over to iTunes right now and get the Netflix app for your iPhone, iPod touch or iPad. Netflix offers one month free trial period after which you will have to pay to have access to their streaming services. Same here. Hopefully someone figures out a way to get it to work on 3.1.2! BTW, if anyone DOES have this working, can you use the Composite video cables to display on a TV? Currently, the hacked method works like a dream on any TV with the Composite cables. simply do this to trick ur phone into thinking it is on 3.1.3.. I have verified that this works for the Netflix app as well… watching right now on 3.1.2! -“Fake 3.1.3” app is available in Cydia on http://cy.sosiphone.com/ repository. Make sure you have added http://cy.sosiphone.com/ repo in Cydia. -search for “Fake 3.1.3” in Cydia and install it. You must restart your iPhone for the changes to take effect.